Good money habits have a way of accumulating and reinforcing each other while improving your financial condition over time. Anyone can develop these 5 simple habits in their daily routine. And they are sure to have a significant impact on your finances. A friend of mine recently told me about something interesting that happened to her. She was going through a stack of mail that had been accumulating on her dining room table. Most of it was junk, but one of the envelopes was from her insurance company. She opened it, thinking that it was just another explanation of benefits, but it wasn't. It was a check. She went through the rest of the stack and found another check from the insurance company. The total amount was several hundred dollars. Those checks had been sitting in that stack of mail for weeks. Her experience is a good example of how developing a few simple habits can positively impact your finances. Opening the mail can be a tedious task, especially given your busy schedule, and mail can contain both good news (i.e. checks) and bad news (i.e. bills). However, establishing a regular routine of quickly going through your mail (like right when you get home from work) can save you money and headaches. Also, unless it is absolutely clear that the item is junk, make sure and open it before you toss it in the recycle bin. Those credit card and bank statements can be so long and boring. Besides, who wants to be reminded of money that you have spent? It's important to review the activity on your statements. Make sure you recognize each item. You might find a recurring charge for a streaming service that you had turned off. You might find an interest charge or a fee that shouldn't be there, or a payment that didn't get posted. Most importantly, if you see charges that you don't recognize, it may be a warning that your identity or credit card information has been stolen. 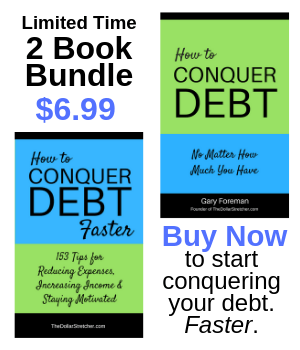 Are You Heading for Debt Trouble? This simple checklist can help you find out and provide options for doing something about it. Throw your leftover pocket change in the jar at the end of the day. You'll probably be surprised how much money will accumulate in the jar over the course of weeks. Also, if you need change to wash a car, pay a toll, or feed a parking meter, you know right where to get it. Related: Could Saving Coins Be a Waste of Time and Money? Put an empty box in the location where you store important documents. Toss your receipts, paid bills, statements, or other documents that you want to keep in that box. That way, if you are looking for a receipt or other document that you haven't filed yet, you'll know where it is. It's a good idea to start a new box each year and label the old one with the previous year if you're going to keep it around. Be sure to shred any documents that contain personal information when you don't need them anymore. A grocery list helps keep you focused on what you're there to buy and reduces the risk of impulse buys. Making a list also prevents buying redundant items when you check your list against your pantry and refrigerator. We keep a central grocery list in the kitchen that everyone in the family edits. That helps to reduce the total number of trips that we make to the store and prevents two people from buying the same things. Developing these simple habits in your daily routine can have a significant impact on your finances. Good habits have a way of accumulating and reinforcing each other while improving your financial condition over time. We've done the legwork to find the best savings account rates for you. Subscribe to Financial Independence, our daily email newsletter. It doesn't cost anything. And, it could make a huge difference in the way you live! Subscribers get Are You Heading for Debt Trouble? A Simple Checklist and What You Can Do About It for FREE! No need to pay for an annual A/C inspection. Find out how you can easily perform a DIY air conditioner check-up and forego the A/C pro. Preventive home maintenance might take a bit of your time each month, but it is better than repair costs taking a bit of your money. And it can keep your utility costs in check, too. Practice one or all of these happiness-increasing tips, and you may be surprised to find yourself wearing a genuine grin before you know it. Saving money doesn’t have to be painful. Put a little wiggle room back in the budget with these five easy budget cuts. Your family will have an extra $200 to pay bills, save up for summer vacation, or put towards some other financial goal.